Genuine Joe® Gel Hand Sanitizer, 67 oz. Gel hand sanitizer features a fast-acting, antibacterial formula that effectively eliminates 99.99% of common germs and bacteria in as little as 15 seconds to promote better hand hygiene. Moisturizing ingredients with Vitamin E help reduce skin dryness to keep your hands feeling silky and smooth with every use. Hand sanitizer is perfect for use on visibly cleaned hands, especially when water is not available. 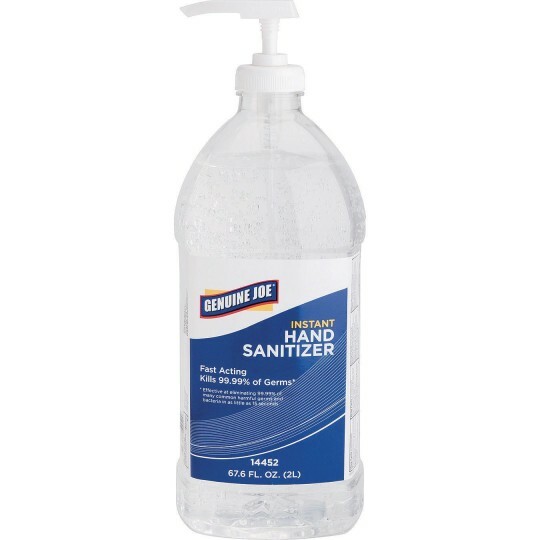 Sanitizer has a fresh citrus scent that is compatible with latex, vinyl, and nitrile gloves. Large 67.6 oz. pump bottle is large enough to share in a classroom, office, or warehouse.